If the oil mist HEPA filter gets clogged, it must be replaced to ensure the continued correct functioning of the oil mist eliminator. The oil mist seliminator Anna, Lova and Nina are equipped with an integrated pressure gauge. They will warn you when it is time to change the filter by means of the LED strip. There are additional information regarding alarms and the LED strip in the description of the control system in the user’s manual. Ensure that the oil mist separator is switched off and the rotors have stopped completely. 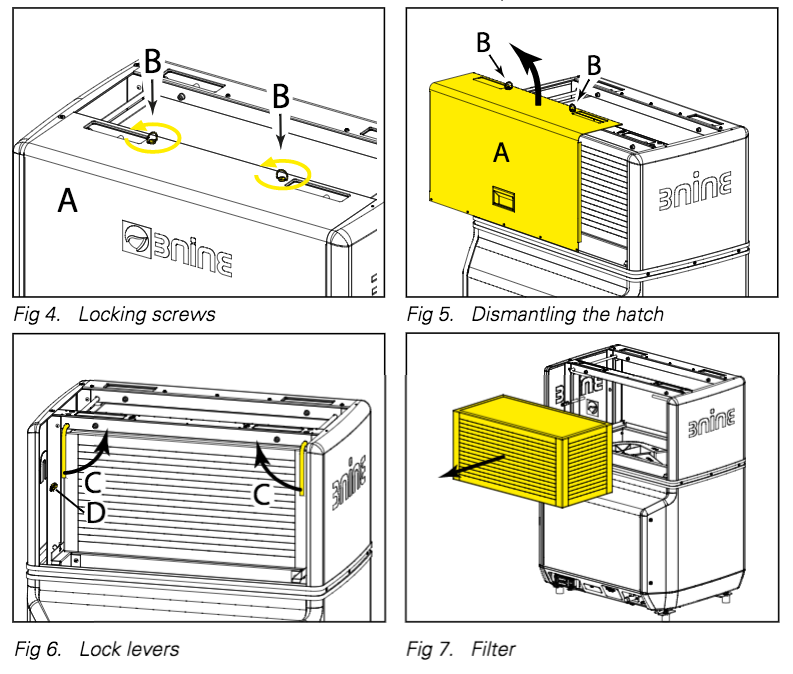 Dismantle the filter hatch (A) by loosening the two (quarter turn) screws (B) on the upper side of the filter hatch (Fig. 5). Then remove the filter hatch by pulling it up out of its groove and then outwards (Fig. 6). Remove and discard contact (D) when changing a blocked filter for the first time (Fig. 7). Loosen the oil mist HEPA filter by turning the two lock levers (C) so they are pointing straight up (Fig. 7). Pull out the clogged HEPA filter, note that the packing can sometimes fasten on the surface and it may be necessary to bend the HEPA filter upwards to get the packing to loosen (Fig. 8). The contact surface of the gasket can be lubricated with petroleum jelly to facilitate fitting the new HEPA filter. Ensure that the HEPA filter is pushed in until it stops. Lock the filter by turning the lock levers back to their original vertical positions. Reassemble the filter hatch and start the oil mist separator.